With my daughter playing a volleyball match in Salinas, I decided to get there via SR17 and Santa Cruz in order to spend a few hours beforehand putzing around some of the minor bumps in the area that I had missed on my visit a few weeks earlier. They turned out better than I had expected, though by no means anything that could be recommended. Views were non-existent or limited, but still there was some fun to be had. This unnamed summit lies within the town limits of Scotts Valley on the west side of Hwy 17. It's a more rural part of the community with homes peppered about through the redwoods that cover much of the hillsides. Approaching it from the north I was taken by an embankment of sand at a turn in the road (junction of Whispering Pines Dr and Blueberry Dr). Hard-packed, with graffiti carved into the cliffs, it was vaguely familiar. I then remembered that Mark Connell, one of my first climbing partners, had lived here some 20 year ago before moving to Colorado, and I had stopped by once to pick him up on our way to the Ventanas. I couldn't pick out which house was his, but it was somewhere very close. I parked at the end of Blueberry Drive away from the No Parking signs that littered the cul-de-sac, in front of another, smaller sand embankment found here. I went to the end of the cul-de-sac and started up on what appeared to be a faint use or deer trail, going steeply up the north-facing slope in search of high ground. Some poison oak was encountered, but not enough to be a deterrent. I skirted one home before landing atop the ridgeline above the sand embankment. A large concrete structure is found here, likely a water tank. Just above this tank is one of two highpoints for Peak 940ft, both of roughly equal height. The second is about a fifth of a mile to the south and I headed through the trees in search of it. Just below the ridge on the west side is an old logging road and I dropped onto it to follow it for easier travel. It turns out to be part of a small network of trails between the various homes. Good spur trails branch off from this road, one of them leading to the southern highpoint where I found a sign from the Hidden Glen Homeowners Assoc. There were short, unsigned wooden posts planted at the various trail junctions as well. A dog could be heard barking while I was at the summit, annoyed at my presence so close to his home a short distance away through the trees. After a brief visit, I set out to explore the various branches of the trail network, hiking a little over a mile in the process. For the most part the homes are out of view from the trails themselves, or mostly blocked by trees, and the trail provides a nice forest experience. The branches I explored either ended at a home from which I quickly retreated, or one of the roads within the Hidden Glen development. The loveliest part was a trail through a shady glen with a small creek, dry this time of year. It was a nice little unexpected treat to a summit with no other distinction (and zero views). This small summit lies in the center of Henry Cowell Redwoods State Park, between Scotts Valley and UC Santa Cruz. It is less than a quarter mile from SR9. The highway is twisty and narrow here, but there are ample parking spots off the road. The only trick is that it's not one of the usual entrances to the park and in fact is signed as Area Closed. 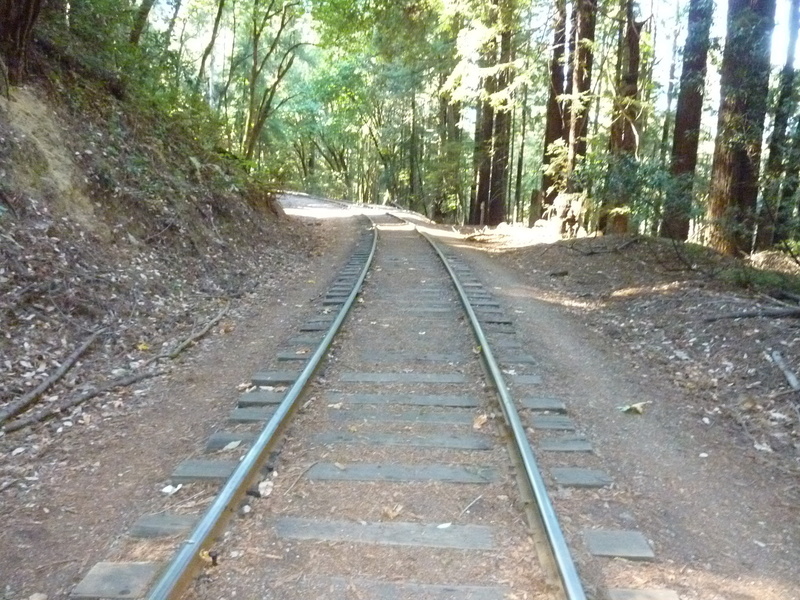 The Roaring Camp Railroad runs between the highway and Hogsback, and they'd like to keep folks off the tracks as much as possible. I parked just west of where the railroad crosses the road, dropping down the embankment to the tracks, walking a short distance along them, and then picking up a convenient use trail to the top of Hogsback. Again, no views, but the use trail saved some thrashing through the underbrush (some poison oak found here, but not too bad). The highlight would have been having a train come through while I was there, but I was a bit late - perhaps another time (later I checked, the only train this time of year during the week is at 11a). This small summit, not even 500ft in height, is located in De Laveaga Park in Santa Cruz. The summit is part of a disc golf course that is quite extensive and popular. There were dozens of guys walking around with their little shoulder bags of discs. To a non-enthusiast, it looks so pretentious with each player carrying a selection of a dozen or more discs from which to choose from. Are they really all necessary? Wasn't disc golf started as an alternative to the expense and pretentiousness of regular golf? To get to the closest parking area, one drives first through the more conventional De Laveaga Golf Course and Lodge before reaching the parking lot for the disc golf course. Parking is $2, but there appears to be other free parking options nearby. The disc golf course would be far nicer if it wasn't so brown and barren. Though there are plenty of trees, there is also a lot of dirt, roots, and errosion that must be an awful mess when it rains. I suppose it's part of Santa Cruz doing its part in a drought. A short hike through the course gets one to the top of La Corona where a memorial bench is located and a view south overlooking Santa Cruz and Monterey Bay. Not much else to this one.